At this point in the year, you're probably abundantly aware of what your income is thanks to the annual accounting ritual of filing your taxes by April 15. And it's pretty likely that your income isn't even in the same galaxy as that of the top 400 taxpayers, which averaged $335.7 million in 2012, according to the latest data from the IRS. The top 400 group -- which is not necessarily the same people year after year -- had a much better payday than they did in 2010, when their average adjusted gross income was roughly $265 million; or in 2011, when it was about $220 million on average. Their federal tax bite also improved. While they paid more to Uncle Sam in dollar terms than in the prior two years -- a little north of $56 million on average -- it wasn't as big a chunk of their income. The group paid an average of 16.7% of their AGI in federal income taxes, down from the 18.04% they paid in 2010 and 17.11% in 2011. Breaking that down further, roughly three quarters of the top 400 filers paid an average rate below 20% in 2012. Indeed, 32 of them actually paid less than 10%. 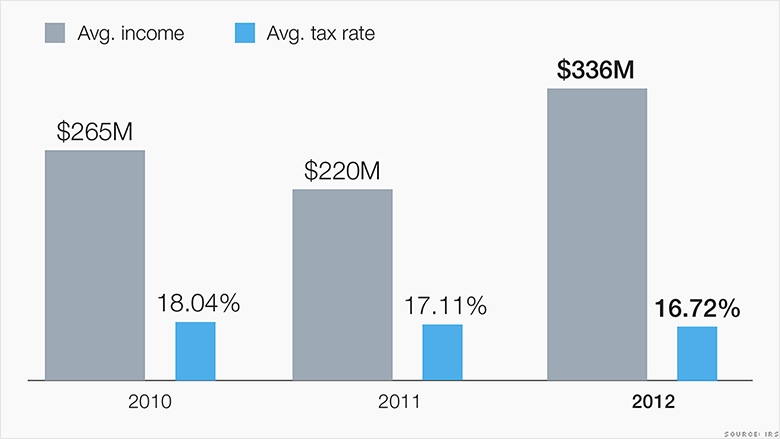 What will be interesting to see is how the group's average tax rate changes when 2013 tax data is revealed. That's when a series of tax hikes on the rich went into effect. Chief among them was a hike in the Medicare tax rate on the highest earners and the application of the Medicare tax to investment income for the first time. Investments, of course, are a big source of wealth for the top 400. And it's a key reason why their tax rates can be so low, because investment income is often taxed at rates well below the top salary tax rate of 39.6%. In 2012, less than 8% of the group's average AGI was attributable to salaries and wages.